Easy integration with your Volusion store and everywhere else you sell. The best USPS shipping rates, including exclusive Flat Rate Green cubic pricing on qualifying packages, plus access your negotiated FedEx and UPS rates. Automatic order downloads from all selling channels, with tracking information sent back to your stores and marketplaces in real time. Robust inventory management with two-way sync to your Volusion store and other marketplaces, automation of purchase orders and supplier management, low-stock alerts, and advanced reporting. Powerful customer marketing with pre-built, customizable email templates, automated product recommendations and reviews emails, customer list import with segmentation, and customer analytics. 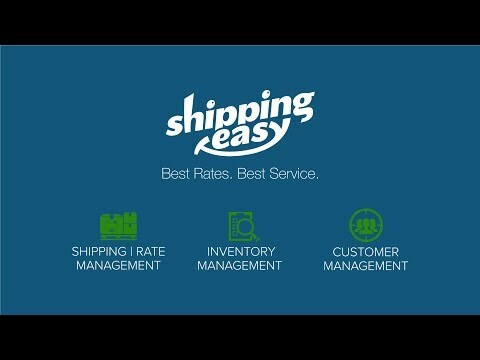 ShippingEasy is the easiest cloud-based shipping, inventory, and customer marketing solution for Volusion merchants. Automatically import orders, send tracking information back to your store, automate label printing at the best rates, and grow your business. ShippingEasy supports all major carriers and marketplaces. Our award-winning phone, chat, and email support is here for you 7:00 a.m. - 7:00 p.m. CT.